This is your last chance to get the Yass method in South Florida to end your pain. I will be in Boynton Beach, Florida at the end of next week, Thursday and Friday, January 25th and 26th. If you are suffering with chronic pain and have recognized that the standard medical practitioners are simply incapable of resolving your symptoms this is your chance to get the Yass method. It foregoes diagnostic test findings which simply identify structural variations like herniated discs, stenosis, arthritis, meniscal tears and similar abnormalities and assumes they are the cause of your symptoms simply because they were identified for the first time at the time you are having your pain. This is insanity. If an MRI were taken even a year before the pain began the very same structural variations would have been identified as these are slow and progressive in nature and take years to develop. So if the structural variation was there before your pain began how can it be asserted it is the cause of the pain? To this point all you have been treated are these structural variations that were identified on the MRI and where has that gotten you? Chronic pain. Chronic pain should never exist. 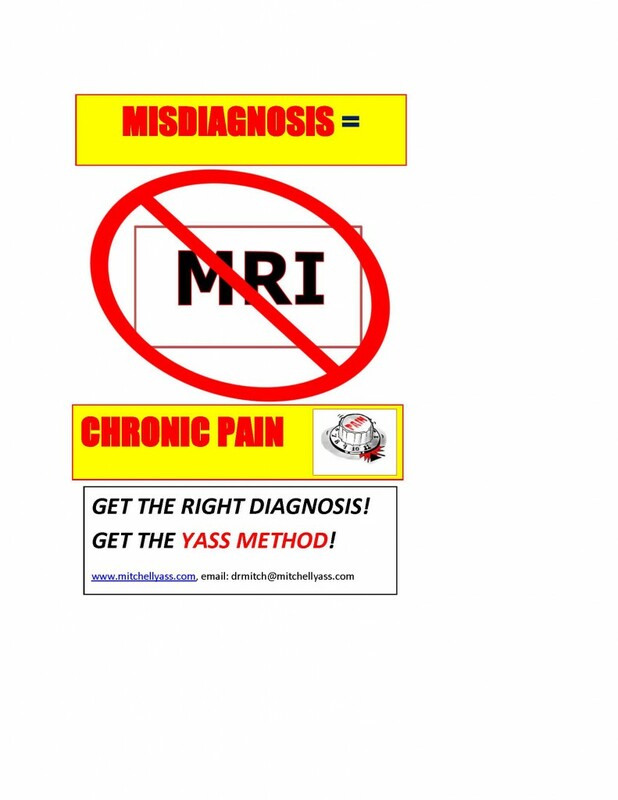 It can only exist if misdiagnosis occurs. Because if the right tissue is identified and treated in the acute stage of distress and when the pain began then pain would be resolved in the acute stage. Staying with the same practitioners and practices and hoping for a different outcome is simply pointless. Get the Yass method and resolve your pain now. It diagnosis the cause of pain by interpreting the body’s presentation of symptoms. If the tissue in distress is eliciting the symptoms being experienced then by understanding the symptoms you can identify the tissue eliciting them. In more than 95% of cases I have proven the tissue in distress is muscle. These types of causes do not show up on MRIs nor is there any medical specialty educated or trained to identify them. If this makes sense to you then you have no choice but to try to the Yass method. If you want to make an appointment or have further questions, you can contact me at drmitch@mitchellyass.com.